The UK's number one TV psychic provides this fascinating and compelling guide to ghost hunting. With tips and hints on tools, locations, and types of spirit activity a budding ghost hunter might encounter, Acorah provides a remarkable guide with plenty of brilliant and absorbing stories of his own encounters. Derek Acorah, well-known from the television programme 'Most Haunted,' has written a guide to ghosts that will fulfil your every ghost-related desire! Whether you want to find your very own ghost, learn more about how Derek does it, or just share more of Derek's fascinating experiences with the spirit world, Ghost Hunting With Derek Acorah is sure to satisfy you! 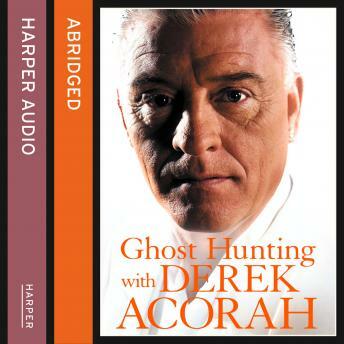 Along with numerous entertaining and occasionally frightening true-life accounts of Derek's own experiences with ghosts, Ghost Hunting With Derek Acorah will give you a fascinating insights into Derek's world and the world of the spirits. - Information of different types of ghost you may encounter, such as residual energy, anniversary ghosts, poltergeists and the spirit people. - Hints on how to prepare and what tools to use. - Where to go to find ghosts, with examples of some of the best places to find a ghost in the UK such as Chingle Hall, Goosnargh, Rufford Old Hall, Ormskirk, Lancs, Speke Hall, Liverpool, and Smithills Hall, Bolton, Lancashire.  Information on which ghosts you might encounter and their history.